The Israeli prime minister has told Jews in Italy the best way to escape "a great wave of anti-Semitism" is to move and settle in the state of Israel. Ariel Sharon was addressing about 100 Jews in the capital Rome on the first day of his official visit to Italy. 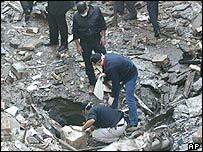 His Italian host Silvio Berlusconi has been a staunch supporter of Israel. The three-day visit follows Saturday's twin synagogue bombings in Turkey which have raised concerns that anti-Semitism is rising across the world. 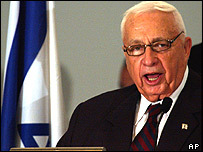 "If Israel is weakened ... the Jews worldwide will not be able to live the lives they live today," Ariel Sharon told the crowd at a Rome hotel. "We are witness to a great wave of anti-Semitism, and apart from the usual anti-Semitism against Jews, there is today the added hate of the collective Jew, which is Israel. "The best solution to anti-Semitism is immigration to Israel. It is the only place on Earth where Jews can live as Jews," he said. Mr Sharon said the issue of anti-Semitism would be "central" in his talks with Italian leaders over the week. He is due to meet with Mr Berlusconi on Tuesday, followed by the Italian Foreign Minister Franco Frattini. Mr Sharon regards Mr Berlusconi as more supportive of his Middle East polices than most EU members. Security in Rome was already tight for the funerals of 19 Italians who died in a suicide bomb attack in southern Iraq last week. Mr Sharon is spending much of his visit inside a hotel, protected by Israeli and Italian security guards. In recent weeks, a poll for the European Commission suggesting that EU citizens see Israel as the biggest threat to world peace caused outrage among Israelis. 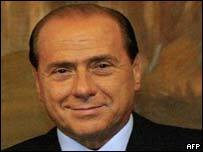 Mr Berlusconi called Mr Sharon personally to express his "surprise and indignation" over the results. His deputy, Gianfranco Fini, has defended Israel's right to build its separation barrier in the West Bank - in remarks that appeared to contradict the EU's official opposition the project. On Sunday, Pope John Paul II specifically criticised the 430-kilometre (270-mile) barrier, calling it an "obstacle on the road leading to peaceful cohabitation". No meeting with the pontiff has been scheduled for Mr Sharon's visit. Mr Sharon and Mr Berlusconi are expected to discuss what is perceived as increasing hostility towards Israeli and Jews across Europe. "A great deal of the time will be spent on dealing with this new phenomenon of rising anti-Semitism," said Raanan Gissin, an adviser to Mr Sharon. In Paris, French President Jacques Chirac was holding an emergency cabinet meeting on Monday to discuss Saturday's arson attack against a Jewish school in a Paris suburb. He was later due to meet Jewish leaders. And on Tuesday EU foreign ministers will hold talks with their Israeli counterpart in Brussels, for the annual meeting of the EU-Israel Association Council. The meeting is part of regular discussions aimed at increasing co-operation between the two sides. "Mr Sharon has a good relationship with the Italian prime minister and regards him as a friend"